Business Units | Myriad Genetics, Inc. 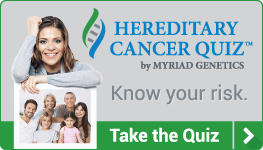 The Myriad myRisk® Hereditary Cancer test is a 35-gene panel that identifies an elevated risk for eight hereditary cancers: Blending both genetic test status AND personal cancer family history, Myriad myRisk hereditary cancer panel represents the next generation of hereditary cancer risk testing. EndoPredict® can help accurately determine an individual patient’s 10-year risk of recurrence to help physicians identify which patients may consider can safely forgoing chemotherapy. Myriad myChoice® HRD is a tumor test that can be used to guide important PARP inhibitor treatment decisions. By testing for status and Genomic Instability Status. BRACAnalysis CDx® is an FDA-approved laboratory developed test for BRCA1 and BRCA2 intended to inform patient management related to the PARP inhibitors, Lynparza® (olaparib) and Zejula® (niraparib). The Myriad myRisk® Hereditary Cancer test is a 35-gene panel that identifies an elevated risk for eight hereditary cancers: Blending both genetic test status AND personal cancer family history, Myriad myRisk hereditary cancer panel represents the next generation of hereditary cancer risk testing. Myriad myRisk identifies elevated risk for 8 important cancers by analyzing multiple, clinically significant genes. If you’re pregnant, the Myriad PrequelTM Prenatal Screen is a non-invasive test that you can take as early as 10 weeks into your pregnancy to learn about your baby’s chance to have a chromosome condition like Down syndrome. The Myriad Foresight® Carrier Screen is systematically designed to maximize the detection of at-risk couples for a pregnancy affected by inherited conditions. Myriad Women’s Health offers seamless support and services to make it easy to integrate genetic screening into your practice. The riskScore® precision medicine tool is clinically validated to predict a woman’s risk of developing breast cancer using clinical risk factors and genetic-markers. It provides women with their remaining lifetime and 5-year risk for developing breast cancer. BRACAnalysis® is a genetic test that detects the presence of a BRCA1 or BRCA2 gene mutation. BRCA mutations are responsible for the majority of hereditary breast and ovarian cancers. People with a mutation in either the BRCA1 or BRCA2 gene have risks of up to 87 percent for developing breast cancer and 39-63 percent for developing ovarian cancer by age 70. Mutation carriers previously diagnosed with cancer also have a significantly increased risk of developing a second primary cancer. In fact, patients with these types of mutations have an up to 64 percent chance of developing a second breast cancer by age 70. GeneSight® is a clinically proven test to enhance medication selection for healthcare providers, helping them get their patients on the right medications faster. Powered by CPGxTM, GeneSight is a proprietary combinatorial pharmacogenomics technology that analyzes how an individual’s genetic variations affect his or her response to medications and provides an actionable, easy to interpret report. GeneSight is used by healthcare providers to help patients that are affected by neuropsychiatric conditions including depression, anxiety, bipolar disorder, schizophrenia, ADHD, posttraumatic stress disorder (PTSD) and other behavioral health conditions, as well as chronic pain. Prolaris® measures the expression level of genes involved with tumor proliferation to predict disease outcome. Prolaris can be used in conjunction with other clinical parameters to determine prostate cancer aggressiveness. Vectra® is a multi-biomarker molecular blood test that simultaneously measures 12 key biomarkers to provide an objective and reproducible measure of rheumatoid arthritis (RA) disease activity. Myriad myPath® Melanoma measures 23 genes for which expression patterns differ between malignant melanoma and benign nevi. These genes are involved in cell differentiation, cell signaling, and immune response signaling. Myriad is dedicated to providing patients and physicians with clinically important information globally. As part of this, Myriad has established International Headquarters in Zurich, Switzerland, a full service laboratory in Munich, Germany and sales offices in Munich, Germany, Paris, France, Madrid, Spain, Milan, Italy, London, UK and Zurich, Switzerland. Additionally, we are working with a number of distributors globally. Myriad RBM, Inc. is the world’s leading multiplexed immunoassay testing laboratory, providing comprehensive protein biomarker services based on its Multi-Analyte Profiling (MAP) technology platform. This platform provides pre-clinical and clinical researchers with reproducible and quantitative data for a few or hundreds of proteins in a cost-effective manner. All services are performed in our CLIA certified laboratory. As a guide to drug development researchers, Myriad RBM also offers companion diagnostic, custom assay development, co-sponsored research programs, and innovative cell culture products and services.